This is your one-stop resource for complete coverage of Exam XK0-004, covering 100% of all exam objectives. You'll prepare for the exam smarter and faster with Sybex thanks to superior content including, assessment tests that check exam readiness, objective map, real-world scenarios, hands-on exercises, key topic exam essentials, and challenging chapter review questions. Linux is a UNIX-based operating system originally created by Linus Torvalds with the help of developers around the world. Developed under the GNU General Public License, the source code is free. Because of this Linux is viewed by many organizations and companies as an excellent, low-cost, secure alternative to expensive OSs, such as Microsoft Windows. 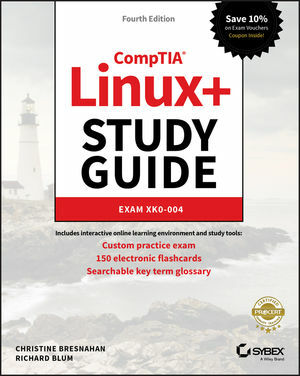 The CompTIA Linux+ exam tests a candidate's understanding and familiarity with the Linux Kernel. As the Linux server market share continues to grow, so too does demand for qualified and certified Linux administrators. Building on the popular Sybex Study Guide approach, this book will provide 100% coverage of the NEW Linux+ Exam XK0-004 objectives. The book contains clear and concise information on all Linux administration topic, and includes practical examples and insights drawn from real-world experience. You’ll also have access to an online test bank, including a bonus practice exam, electronic flashcards, and a searchable PDF of key terms.